Home › Mental Health › When Will Equal Actually Mean Equal in Mental Health Care? A man sits in a doctor’s office, three year old copy Sports Illustrated in hand, waiting for his cardiologist to come in and let him know how the results of his EKG. The guy is only 57, but his dad keeled over from a cardiac arrhythmia at 60 and his dad’s dad died in his late fifties because his aorta was clogged with plaque that was as thick as tartar sauce. He got yearly checkups from his regular doc for a while, but had a “minor heart attack” a couple of years ago and started seeing a specialist at Mercy. Eventually, the doctor comes in and sits down on his little backless swivel stool, letting our man know that all of his vitals look good. Since the hospital started him on some beta blockers two years ago, the plaque buildup had all but stopped and his heart function has been solid. The only problem is, now the cardiologist had to tell him that his insurance would no longer be covering his heart medications because there was a 24-month lifetime cap on them. He would have to either, find a way to cover the full cost of the meds himself or try his luck with the body God gave him and hope for the best. Now, if this situation ever occurred in reality, the heart patient would promptly go out, hire an attorney and sue his insurance provider for millions of dollars. All 50 states and the Federal government have a number of minimum coverage requirements that insurance providers are mandated to follow and, not covering a client’s life-saving heart medication definitely breaks those requirements. However, as far our nation’s health care laws are concerned, not all diseases are created equal. Mental health and substance abuse issues have historically been treated as the discarded stepchild of American medicine, quite literally sent off to the asylum to rot in squalor while those with “real diseases” get treatment. For the first two hundred years of our nation’s development, our mentally ill were cordoned off in Almshouses, often with the poor, indigent and senile members of society who were deemed unfit for inclusion with the general population. In a Report on Pauper Insanity presented to The Baltimore City Council in 1845,1 Dr. Stephen Collins acknowledged to his audience that it was “universally admitted” at that point in time that Almshouses are ill-equipped to handle the needs of the mentally insane, going so far as to label them, “as sepulchres, in which the mind is entombed almost as hopelessly as in the solitude of the grave.” And, if anyone reading this report had occasion to doubt this fact, Dr. Collins encouraged them to walk through the Almshouse and pass by the cells, “which are the receptacles of living death” (emphasis his). In the mid-19th century, as germ theory was forming and surgical knowhow expanding, mental illness lay in darkness. We often speak of American Exceptionalism with great reverence, as it encompasses all of the unique attributes in our nation’s character that have enabled us to become “the greatest country on earth”, or whatever Manifest Destiny-laden nugget of jingoistic hyperbole we might choose to believe. When it comes to our pioneer spirit or mythic class mobility (mythic both in that it is part of the folklore of the American Dream and that it really doesn’t exist), Americans are all too ready to embrace exceptionalism. The same cannot be said for exceptionalism in our health care system. While the example of Dr. Collins’ report on the hellish contents of Baltimore’s almshouses was an extreme example, it represents the core elements of exceptionalism in mental health and substance abuse. These men and women have been excised from the community and placed in dark, dank cells away from the gaze of society and the influence of modern medicine. 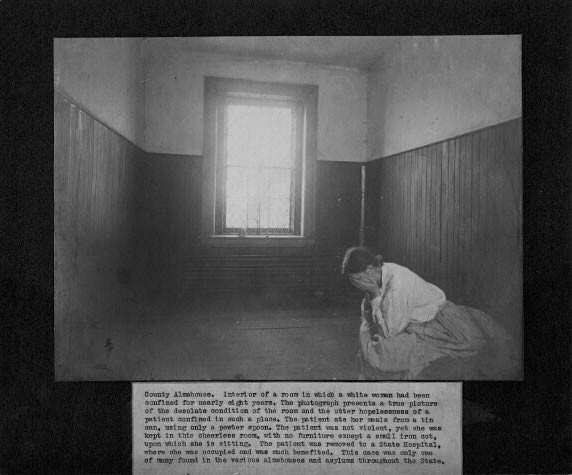 When the standard mode of care transitioned in the latter part of the 19th century from the almshouse to the state asylum, the isolation of the mentally ill was retained. For the next hundred years or so, psychiatry and the mentally ill were seen as categorically different than traditional medicine and the physically sick. And yet, mental health and substance abuse services are still routinely dismissed by health insurance companies, sloughed off as non-necessary care that isn’t covered under plans where a physical ailment would be. Just this winter, the state of Maine made a change to the pharmacy coverage of MaineCare, the state’s Medicaid provider. Beginning on January 1, 2013, those suffering from opiate use disorders had a lifetime maximum of 24 months of coverage for methadone and buprenorphine maintenance treatment.3 Maine has taken an evidence-based, long term treatment that successfully enables residents to recover from opiate addiction and they have arbitrarily cut them off from it after two years. This decision was not made based on any research that showed opioid abusers had better recovery outcomes if they were taken off of medication assisted treatment after 24 months. This decision is based on stigma. It is predicated on the idea that patients with opiate use disorders are out to game the system and get high off the government’s dime. It is baseless and it is the type of decision that keeps substance abuse and mental health services outside the mainstream, regardless of the Surgeon General’s statements to the contrary. Could a state government put a lifetime cap on insulin or antibiotics? Answer that for yourself and you’ll have an idea if mental health and substance abuse treatments are integrated yet. Vis á vis Maine: Gaming the system for wanting more than 24 months’ methadone treatment?!?!?! “or whatever Manifest Destiny-laden nugget of jingoistic hyperbole we might choose to believe” Love this line (where to you get this stuff)… we have much to open our eyes to. As always, thanks for encouraging me to think—better.